"We're falling into a rhythm," said Today co-host Hoda Kotb. "We understand when the other is going to jump in on something. It's almost like jumping rope. 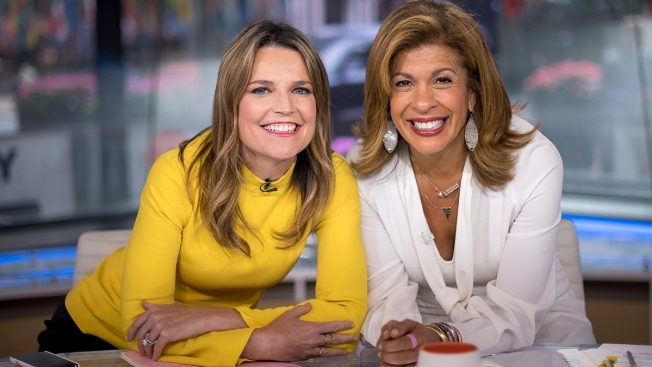 You start getting the hang of it"
"Today" show co-anchors Savannah Guthrie, left, and Hoda Kotb pose on set at NBC Studios on Wednesday, June 27, 2018, in New York. Never let it be said that Savannah Guthrie doesn't have her partner's back. Hoda Kotb left behind her glasses after a recent meeting so her "Today" show co-host scooped them up, although she's not above pointing out that they needed a wash.
Guthrie and Kotb mark six months together next week, a partnership thrust upon them by November's firing of Matt Lauer on sexual misconduct charges. Their performance has allowed NBC News to recover from the shock with little apparent damage to its most valuable property, even as morning television in general adjusts to a world in which many people reach for smartphones instead of TV remotes upon waking. "We're falling into a rhythm," Kotb said. "We understand when the other is going to jump in on something. It's almost like jumping rope. You start getting the hang of it." You can sense the exhales in NBC corporate suites, where fear of the unknown was real. Lauer had dominated "Today" for two decades, the highest-paid talent in television news, and disappeared from the screen with no notice. A former morning producer predicted in the Los Angeles Times that "Today" would lose between 10 to 15 percent of its audience without him. Instead, the 4.2 million viewers that "Today" has averaged since Lauer's departure is down 2 percent from the same period a year earlier, a smaller decline than rivals "Good Morning America" and "CBS This Morning." ''Today" typically runs a narrow second to ABC's show in popularity and leads among the 25-to-54-year-old demographic, the measuring stick for most advertising sales. "The partnership between Savannah and Hoda has worked out in wonderful ways that we expected and wonderful ways that we couldn't have anticipated," said Noah Oppenheim, NBC News president. "Building on their partnership, the rest of the show has taken on different colors and textures that are resonating with the audience." Yet after doing surprisingly well over the holidays and getting a boost from the Winter Olympics, NBC has fallen consistently back to second place. One worrisome number for a show that has two women as co-hosts for the first time in its history: since the Olympics, NBC's viewership among men in the advertising demographic has declined 14 percent compared with last year, while ABC is up 2 percent, Nielsen said. Guthrie, a former White House correspondent for NBC News, has been co-host since 2012. Kotb is a news veteran, too, although best known to "Today" viewers for pairing with Kathy Lee Gifford on the show's boozy fourth hour. While each has an area of expertise, Guthrie's political experience makes her a natural for those interviews — the morning demands versatility. "I wasn't looking to be the big man on campus," Guthrie said. "Big woman," corrected Libby Leist, the show's executive producer. The hosts' experience sent a message of stability that got the show through its difficulties, she said. "That's why I think the show has done so well, because you weren't sitting there thinking, 'Who's that person? What kind of experience does that person bring?'" Leist said. "You kind of felt that it was going to be all right." The phrase "looking forward" is usually heard when someone at "Today" is asked now about Lauer. "Some things you just carry," Kotb said. "You go on about your life and you might turn something on or flip a page and see a story about it. It's like picking at a scab. It hurts, but at the same time you know you have a big responsibility and you go on. But if you forget everything, maybe you never cared in the first place." Leist has tweaked the show, keeping its bones intact. She places special emphasis on explaining complex issues clearly to viewers, and the show isn't seduced by the latest smartphone bulletins. Fascination with the internet is fading; viewers don't always need to know what's trending or what video has gone viral. She and the hosts are shaping the show with their own news judgment — last week they debated whether a story on the accidental drowning of skier Bode Miller's daughter was too depressing, but ultimately felt it was important to warn about the dangers of toddlers and pools. "Today" also seeks its own twist on interviews, and Craig Melvin's tense talk with Bill Clinton about Monica Lewinsky made news. Beyond the substance, morning-show teams are judged to a large extent on whether viewers want to spend time during an intimate part of the day with the people onscreen. NBC isn't so far removed from the days of Lauer and Ann Curry to forget what happens when chemistry goes terribly wrong. "I can't figure out which one is Thelma and which one is Louise," said Gail Shister, longtime television columnist at the Philadelphia Inquirer and now a University of Pennsylvania professor. "They're so wacky and unpredictable. I think they've got wonderful chemistry." Kotb is continuing the show's fourth hour with Gifford. Published rumors have NBC considering switching Megyn Kelly's third hour with the fourth, although Oppenheim said it's not being contemplated "right this second." Kotb will go with the flow: "Drinking at nine or drinking at 10, it's still drinking," she quipped. Guthrie said a new team gives "Today" an opportunity to take chances. "You can be joyful and light, but also substantive and not silly," she said. "I think we're all trying to move in that direction, to be fun and not frivolous."